The first time I came to know about S.N. BOSE fellowship through one of my senior, I never thought one day I am going to pursue this opportunity in my life. It was 28 th of January, while celebrating one of my friend’s birthday, when I accidentally opened the G-mail app in my mobile phone and came across the e-mail with subject mentioning “congratulations.” It took me a while to digest the reality. I told my friends and parents about the achievement and the response I was getting from them, made me realize the essence of this success. I realized that I was running late by three days to respond the e-mail and contact the potential supervisors who could host me for this internship. Luckily, Winstep was flexible enough to provide me an extension and amidst of so many negative responses, I felt a sudden rush of adrenaline in my veins, when a response with positive words popped up on my laptop screen at around 1:30 a.m. on 21 st February, 2018. It was from my US supervisor Prof. Josef Werne at University of Pittsburgh. That night, the first stone towards my US journey was paved. Then the most tedious part of this whole journey has begun, the visa application process. Fortunately, Prof. Werne was quick enough to send me all the required J1 visa documents and I didn’t get stuck anywhere before obtaining the Visa. Tickets were booked by the travel desk and everything was set to start the journey. But there was a constant sense of inhibition inside me as this was the very first experience for me to fly abroad. Thanks to Shalini, Ishaque, Debasmita and Kriti, who made this hectic 22 hours journey to Chicago a memorable one. The orientation, the bus trip to Chicago downtown and getting lost during Chicago night out were some of the things that made the short stay at Chicago eventful. Elliotte, my senior most lab member, picked me from the airport and showed me the convenient stores around my neighborhood in Pittsburgh. From the very first day I fell in love with the welcoming ambience of the city. A perfect hilly weather and a cozy apartment provided by my supervisor was definitely an add on to my comfortable stay. First day at lab included discussion of my project work and getting along with my lab mates and the lab facilities. 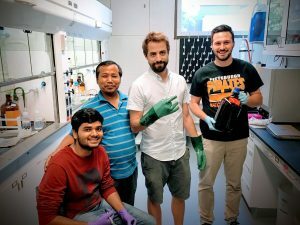 Since the instruments of my interest were not properly functioning then, Elliotte, Steve and me spent around 20 days fixing those instruments and that was the time when I came out of my comfort zone to learn a new method of lipid extraction, Soxhlet method. And as always, I broke some of very expensive lab wares during the entire setup process. But Prof. Werne never discouraged me from experimenting something new and it definitely helped me developing a keen interest in scientific experiments. I learned to operate Gas chromatographs and Isotope Ratio Mass Spectrometers by the help of my extremely helpful lab members. They were patient enough to answer all my queries and rectify my mistakes throughout my internship. I learned the separation of polar and a-polar fractions of lipids and separating different compounds of interest by using column chromatography technique. Apart from work, the part that made me feel so connected to Pittsburgh and it’s people were the good fun moments. 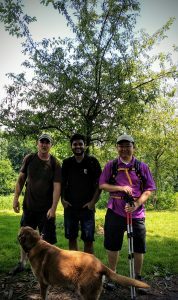 Starting from hiking in the Pennsylvanian woods , road trips through the mountainous roads to the sudden plan to New York, everything was a perfect mixture of fun, learning and bonding with people , whom I never met before. Most of the weekends we use to explore new food places, trying to satisfy our taste buds with different cuisines. 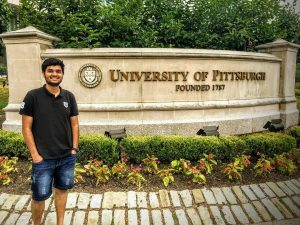 The University of Pittsburgh is located in the heart of the city, which helped me exploring different fun activities organized around the city during every weekend. Taking a walk through farm grown fresh products in the Farmer’s market during the Sundays and cooking Indian dinner with US lab mates were something worth cherishing. A short meeting with Khorana alumni Mr. Raghavendra Partha has helped me a lot in terms of communicating my ideas with other faculty members in my department. Last but not the least, all these were possible due to the combined efforts from IUSSTF and Winstep Forward. Thanks to Mr. Shravan , Ms. Parul, Ms. Alexis and Mr. Eric for helping us throughout this journey. I would say this opportunity has changed the way I use to perceive every situation in life. This is a scientific exposure intercalated with tons of new experiences, everlasting friendships and new perspectives. This internship helped me explore the questioner, traveler and the philosopher inside me.